On a clear day, with a blue-blue sky touched by wisps of high cirrus, few American cities could be as spectacular as San Francisco. Not only are there steep hills and vistas but, in many of the residential streets, there stand—plentiful and elegant—the distinctive wooden houses sometimes known as Queen Annes, in tasteful yellows, restrained greys, and demure beiges. Nor are the staples of art, education, and gustation, neglected here. On the new University of California San Francisco Campus at Mission Bay, there are outdoor art-works which include two 49-feet-tall steel plates by local sculptor, Richard Serra. One of the plates slants sideways slightly to the north, and the other slightly to the south. They stand outside an eatery called Peasant Pies that is furnished with beautiful tables made from wood salvaged from demolished buildings. I was pleased to find in it a Soup and Pie Combo for $5.70: Vegan Vegetable Soup plus a Basque Beef and Potato Pie. Delicious. Transport, too, is very fine in San Francisco. As well as the excellent buses and trains, there are, of course, the famous cable cars. In each one, a giant pincer device passes down through its floor into channels in the roadway wherein run the cables at a constant 9.5 miles an hour. The car operator, known as the gripman—typically a six-foot-something twenty-five-year-old—hauls heftily on a long lever to clasp the pincer onto a cable so that the car can be pulled by it up the steep hills. I understand that the first gripwoman, after working on her upper-body strength, started employment in 1998. The pleasure of a ride on a cable car is exceeded only by a visit to the cable barn, where one can see the marvellous machinery and winding gear for the cables. 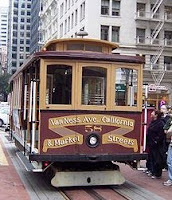 Almost as good as the cable cars is the F-Market streetcar line that runs from Fisherman's Wharf, to the Embarcadero, and up the hill of Market Street to Castro. Although many of the F-Market cars are only sixty years old, some are much older. They have been brought here from across America—from New York, from Baltimore, from the Boston Elevated Railway, and elsewhere—and some have come from as far away as Italy, Australia, and Japan. My mother-in-law, whom my family and I are visiting, lives in a house not far from where the F-Market streetcars turn round. Her road is parallel to, and further up the hill from, Castro Street. From her windows one can look eastwards across the roofs, to the fjord-like San Francisco Bay, and beyond to the Berkeley Hills and Oakland. On many days, a vivid sunrise splashes a mile into the sky across the whole eastern horizon. And, as daylight grows and I gaze out across the city, I wonder whether, in a moment, a flying saucer might glide noiselessly past. My mother-in-law lives on the edge of San Francisco's gay district where one sees, in the shops and on the streets, many more lesbian and gay couples than straight couples. She attends a church which is also the Catholic Church of the gay community, which has a fine choir and holds services which have about them a certain ceremony. Religious belief is beyond my capacity, but on some Christmas Eves, I have gone with my mother-in-law and the rest of the family to this church. One year, I remember a warm and humorous priest giving a sermon that took the form of a shaggy-dog story. It was about the three kings, bearing gifts of gold, frankincense, and myrrh, from the East, following a star on their journey to Bethlehem for the first Christmas. It had all the detours and innuendo necessary to a good shaggy dog story. Its culmination was achieved—one could imagine it happening right here in San Francisco—when the three kings reached the end of their journey, but were mistaken for three queens. The editors of OnFiction wish all our readers a happy 2010.